Heat oven to 350°F. Pierce sweet potatoes all over with fork; place on cookie sheet with sides. Bake 1 hour 15 minutes to 1 hour 30 minutes or until tender when pierced with fork. Let stand 15 minutes or until cool enough to handle. Meanwhile, in 1-quart saucepan over medium heat, heat butter, brown sugar, milk, corn syrup and cinnamon to boiling, stirring constantly. Boil and stir 1 minute or until slightly thickened. Remove from heat; keep warm. Peel sweet potatoes; place in large bowl. Mash until no lumps remain. Add cream and salt; mash until smooth. Spoon potatoes into large serving bowl. Serve with brown sugar sauce. Top with toasted pecans to make it extra special. 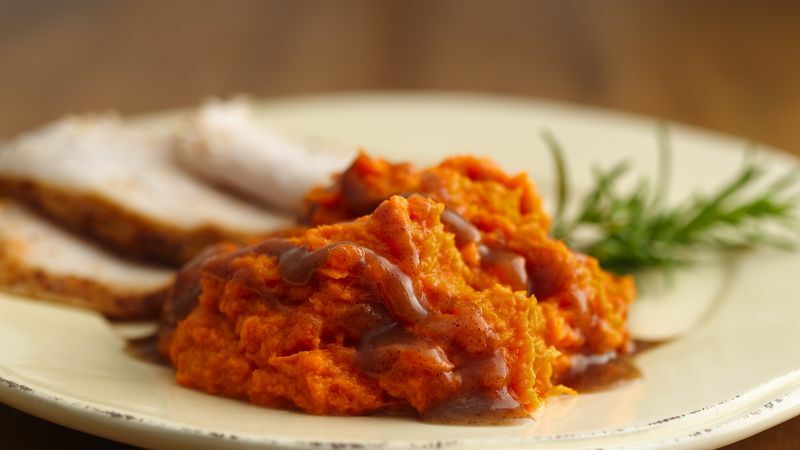 Mashed sweet potatoes can be held on Low heat setting of slow cooker up to 2 hours. The brown sugar sauce can be make ahead and reheated right before serving. If sauce seems a little gritty, simply add 1 or 2 tablespoons of heavy whipping cream.